If you’re looking for the most talented light, which who wouldn’t be?! Well then you’re in luck, because t’Light actually stands for the Most Talented Light. 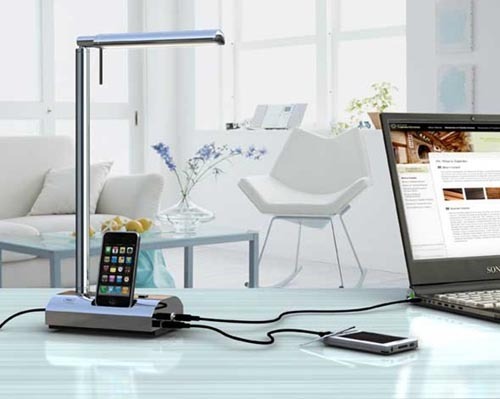 Not only does this light illuminate your desk, but it also has a little love for your smaller electronics and cuts down on those obnoxious cords. Don’t worry, it’s not just a concept design either, this one can actually be purchased. On the top is a 3 watt LED lamp that can last about 50,000 hours worth of usage. Then on the base itself there’s a handy little iPhone dock. There’s also a jack powerful enough to power up your laptop and a USB port. Besides the shiny metal look it comes in several other colors like red, black, a horribly bright green, pink, purple and more. The whole thing can be purchased for $89.